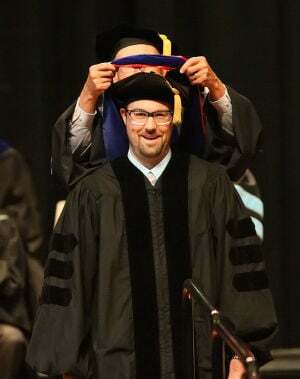 Douglas Kegarise receives his hood as the first doctoral graduate of Lancaster Bible College, at the college’s commencement ceremony Saturday. Kegarise earned his doctorate of Leadership Studies. J. Douglas Kegarise, pastor of development and deployment at Grace Church, Lititz, Pa. (Ivanildo Trindade, pastor) received a PhD degree on Saturday from Lancaster Bible College — the first to receive a doctoral degree from the school. Lancaster Online told the story. A portion of it appears below. Click here to read the complete article. 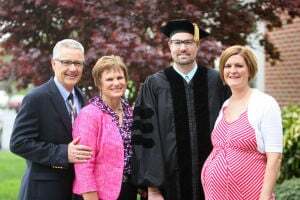 Lancaster Bible College and Capital Seminary celebrated 186 graduates on Saturday at its Good Shepherd Chapel, but one among them was a particular star. Douglas Kegarise, 32, of Manheim, received LBC’s first doctoral degree, a Ph.D. in leadership studies. Douglas Kegarise, second from right, is the first doctoral graduate of Lancaster Bible College. He received his Doctorate of Leadership Studies at Saturday’s commencement. With him is his wife, Renee Strickler, right, and his parents, John and Mim Kegarise. “It’s felt some days like I’m a pioneer and some days like I’m a guinea pig,” he said before commencement. Kegarise, who earned his undergraduate degree in international business from Grace College in 2004, didn’t even plan to get a master’s degree. “But the doors of opportunity just opened up … and I felt like God was saying to pursue those opportunities,” he said. In 2006, after volunteering with youth at Grace Church in Lititz, Kegarise joined the staff to oversee student ministry. A few years later, one of LBC’s administrators encouraged him to pursue a master’s degree. He earned an M.A. in ministry in 2011 and continued on to LBC’s new doctoral program.